Oreck air purifiers have been all over late night television. They promise clean air. They claim to get rid of dust, pollen, and other allergens. Supposedly they also remove VOCs and odors. They use permanent filters that don't have to be replaced. Oreck is Famous for Vacuums. Oreck is a well known company name. They are probably most famous for making vacuum cleaners. Oreck was founded in 1963. You can read more about Oreck here. It was founded by David Oreck. He is a very enthusiastic CEO. He is also a great salesman. He stars in his own commercials and speaks directly to people. He inspires trust. But do his air purifiers work? It is hard to find objective information about Oreck air purifiers. Almost everything is advertising. It's a good strategy. Flood everywhere with advertising information and eventually everyone will believe it. Past models have had problems. In objective reviews they were not recommended. The reviews said they did not clean the air well. They also were noisy and released ozone in the air. Oreck has released this new line of Proshield air purifiers. Do these work better than the professional series. These include a stronger fan. They also use an oxygenator that converts ozone into oxygen. It uses a permanent filter. You simply have to clean the filter regularly to keep the purifier working well. This uses a permanent filter that never needs replacing. It also uses a UV light to kill bacteria and eliminate both VOCs and odors. Oreck XL Tower Air Purifier. It also uses a permanent filter. It is designed to clean a larger room. Oreck 5 Stage Air Purifier. Oreck purifiers use a 5 stage filtration system to clean the air. The Truman cell is at the heart of the system. Oreck Accessories for Air Purifiers. 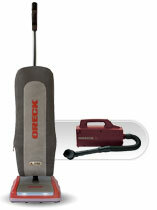 Oreck offers several accessories for their air purifiers. They include air fresheners, filters, and cleaning supplies. Leave Oreck Air Purifiers Page and Return to All About Air Purifiers Home Page.